As people’s work practices change, the need to effectively communicate and share information becomes even more crucial to the efficiency of running a company. 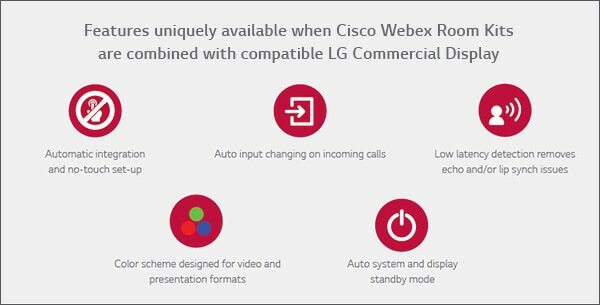 Cisco and LG are bringing together our core business strengths with the Room Kit and Room Kit Plus with LG displays to offer outstanding solutions for video conferencing, content delivery and presentation capability, with compatibility and premium features. These solutions ensure the user experience is simple, straightforward, eye catching and engaging. 24/7 solution support is available online for total peace of mind and guaranteed productivity. The Room Kit – which includes camera, codec, speakers, and microphones integrated into a single device – is ideal for rooms that seat up to 7 people. The Room Kit Plus – with a separate quad-camera bar – can accommodate larger and deeper rooms of up to 14 people. Both products offer sophisticated camera technologies that bring speaker-tracking capabilities to every room. When coupled with LG displays, they offer an outstanding, crystal clear, turnkey conferencing solution. Inbuilt features enable smarter meetings, presentation capabilities and room/ device integrations. This removes the barriers to usage and deployment of video in small to large-sized rooms. With six screen sizes available from LG and dual screen sharing option, seamless integration of interactive and video content is unparalleled delivering a more engaging ‘in-meeting experience’ through powerful features, networking and display technology.